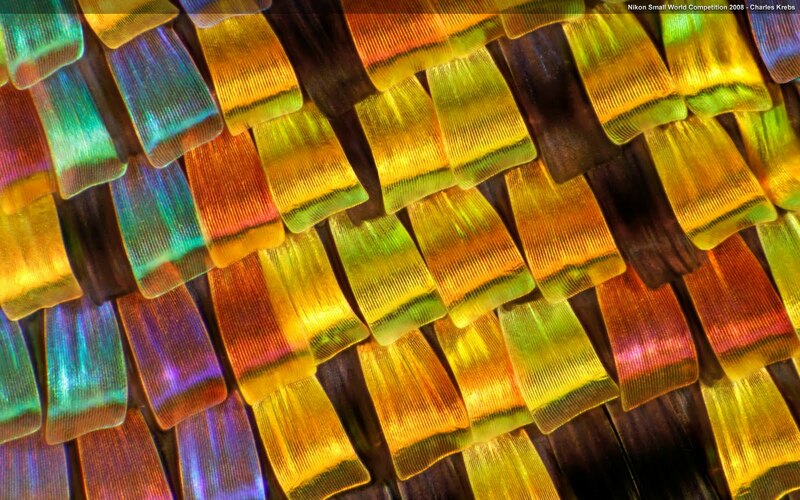 I have posted some amazing images on my blog that come from the NikonSmallWorld site. They host an annual photomicrography competition of photos taken with the aid of a light microscope. Every day they post an image of the day. This link takes you to the gallery. This image below is a "Brainbow" transgenic mouse hippocampus taken by Dr. Tamily Weissman at Harvard University in 2008. 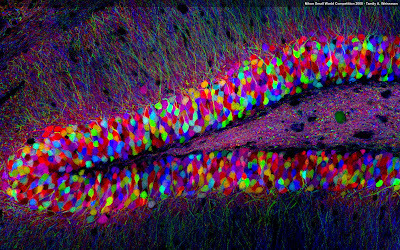 The image below is a "Brainbow" mouse brain stem with auditory pathway axons taken by Dr. Jean Livet from Institut de la Vision in 2008. The image below is of the wing scales of Urania riphaeus (Sunset moth), taken by Charles Krebs of Charles Krebs Photography in 2008. 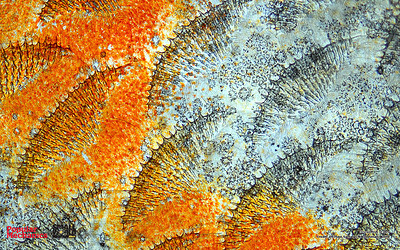 Below are Discus fish scales, taken by Dr. Havi Sarfaty from the Israel Veterinary Association in 2009. 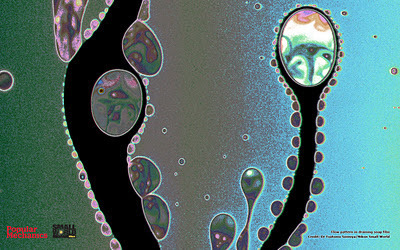 This next one is a flow pattern in draining soap film, taken by Dr. Tsutomu Seimiya at Tokyo Metropolitan University in 2009. 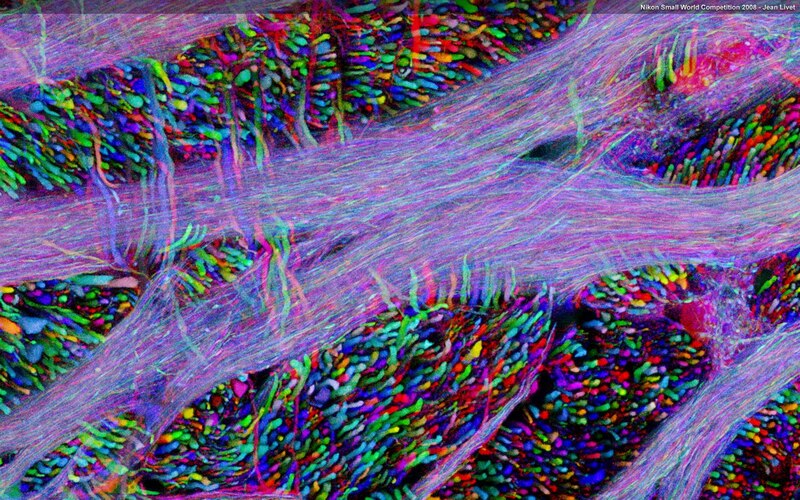 There are many more astonishing photos; go take a look! We are now halfway through a fourth consecutive month of rain. Last month, there was more rainfall in the first three days of September than the usual average for the entire month. People who have lived here for thirty or forty years say that they cannot ever recall another summer as rainy as this one. "Consequence of global warming," mutters my friend Robert. Today around mid-afternoon, the clouds lifted a little and it brightened up. No actual sunshine, mind you -- just high cloud cover and diffuse light. Time for a walk, or, "the W-thing," as I said in front of the dogs in a vain attempt reduce their pre-walk frenzy. So off we went, the dogs and I. For the first block, Kate ran in tight circles barking repeatedly in a high-pitched piercing manner, and Sophie chased her trying to bite her. The usual, in other words. Once the dogs settled down, I had time to notice the brilliant fall leaves: yellow of the poplar trees, ranging from cadmium yellow light to cadmium medium, and maple leaves in red, scarlet, and yellow. The big yellow maple leaves reminded me of my annual childhood fall endeavour. I used to go out and collect autumn leaves, the most colourful, unblemished ones that I could find, then bring them home and iron them between sheets of wax paper. Do children still do this? Perhaps I thought I could keep the leaves forever, preserved this way. Somehow I could stop time and freeze their beauty. Of course those tattered little squares of wax paper are long gone. Now I am walking down the hill on the other side of middle age. But when I look at the profusion of autumn's colours, my eyes sharpen as I enthusiastically scan the bushes to either side of the rutted track, looking for the loveliest, least blemished leaves. Turns out, it wasn't the collecting or preserving of the leaves that was most important; it was the looking. I was over at Robot Nine tonight, and I wanted to share a couple of lovely images from that website. Their catch phrase is: "Funny Stuff! Daily Updates!" 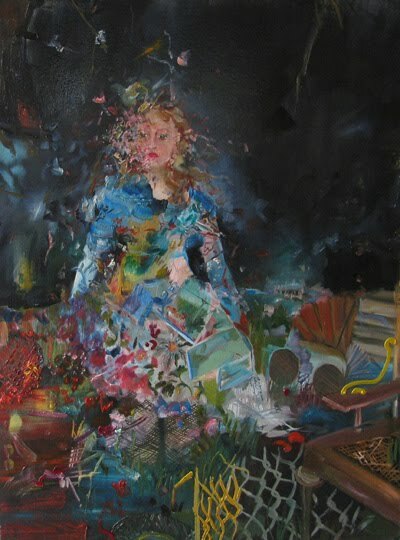 They do post lots of humorous images, but they also feature images that are powerful and offbeat examples of visual art. This first image is called Cracked River Stones. It was posted today, September 27. Those of you who read my earlier post about river stones might remember why I am drawn to this photo. 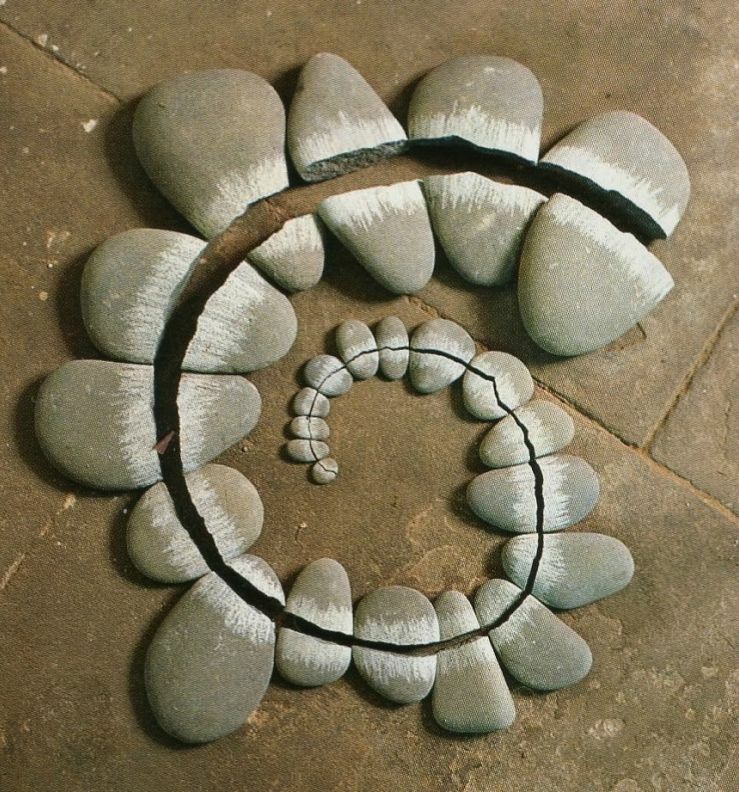 I like the way the artist has used chalk on the stones to enhance the spiral, calling to mind the chambered nautilus, the garden snail, and the human cochlea. 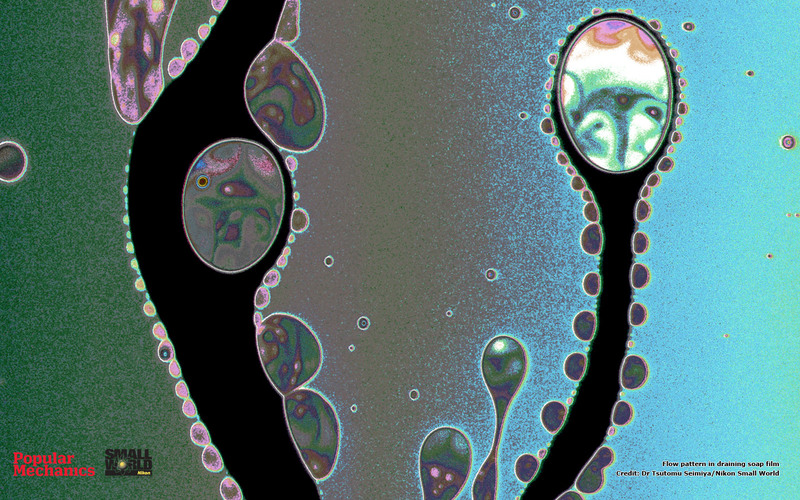 This next image was posted September 19 and is called Soap Bubble in Mid Burst. 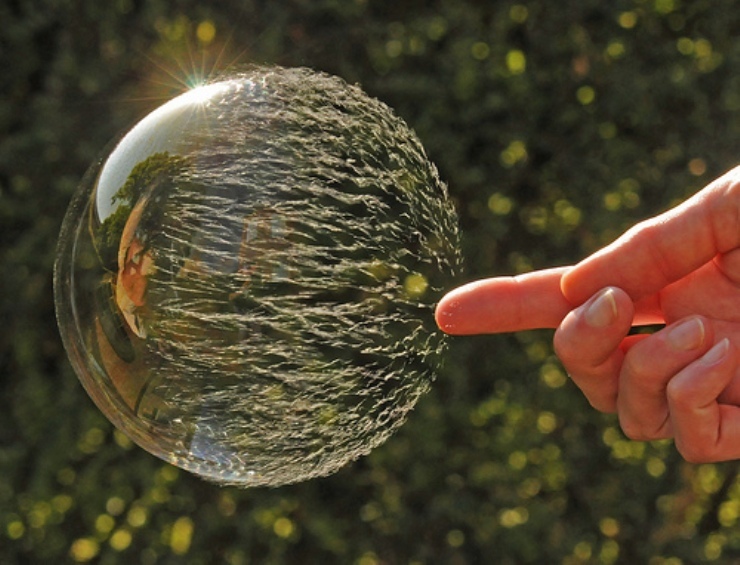 This one pleases me because of the way it has frozen the action, allowing us to see the bubble in a way that we usually cannot. Bubbles are there, and then they are not, and this is one of the things that fascinates us about them. This image is existential. It is about time. And it is about the moment of transition, something I wrote about previously in Rolling Balls of Mercury. 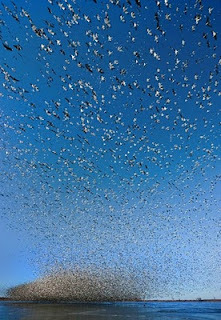 This third and last image, 1.3 Million Birds speaks for itself. This one was published on Robot Nine on September 8. What I see in nature never ceases to fill me with awe. Our little human attempts at creativity and building our world seem so piddling in contrast. 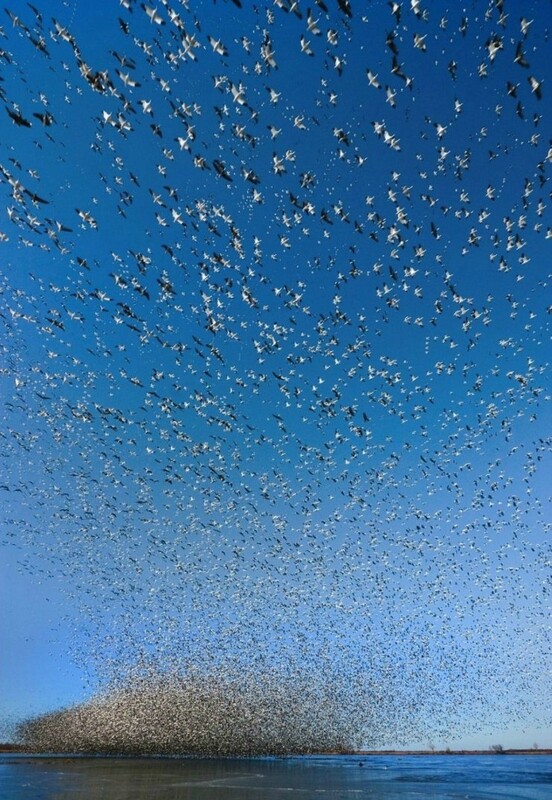 Just look at all those birds! Three weeks ago, Rob and I took my youngest off to university. We got him all moved into residence, did a major grocery shop at the supermarket nearest to the campus so that he would be well-provisioned for at least a week or two, went out for a special family dinner, and then waved good-bye. Until Thanksgiving. Thanksgiving seemed to this new empty-nester like a very long six weeks into the future. I was prepared to be sad. I thought that I might cry a little on the seven-hour drive back home. I knew that I would feel a deep need to phone him (or at least text him) daily. I kind of expected the feelings of glumness and irritability. I wasn't surprised, once we arrived back home without him, that the house seemed way too big and unnervingly quiet. But I was surprised about the groceries. Apparently Rob and I don't eat anything to speak of. When we left to take my son to university, the fridge and cupboards were quite bare. I knew that I would have to shop the minute I returned home. Well I didn't. And I still haven't. Yes, we've run out to pick up a couple of small items a couple of times: bread, milk, eggs, beer, and cat food. But that's about it. I used to to be that woman you'd see in the grocery store late at night, racing up and down the aisles just before it closed with a hugely overloaded cart. I'd have all the usual stuff: two big jugs of milk, several packages of meat, four or five types of fresh vegetables, two or three types of fruit, the giant economy slab of cheddar cheese, and bulk sized boxes of breakfast cereal. And, I admit with a blush, there were several kinds of junk food and prepared foods in the cart too: frozen pizza, cola, chips, cookies. A week or ten days later, there I would be, back in the grocery store doing it all over again. As it turns out, Rob and I weren't eating that much of the cartloads of groceries. Since the end of August, we have been getting along just fine on the frozen salmon in the freezer that we caught during the summer, the various veggies offered up by my little weed patch of a garden, and the apples that are now ripening on the trees. Regular sized boxes of crackers or cereal now last and last. Whatever I buy stays in the cupboard or fridge, and is still there when I go to cook dinner. I look into the pantry and can't imagine how I will ever manage to use up all those cans and boxes of stuff that I see there. I may never need to shop again! Oh wait. Thanksgiving is coming soon. What a week! This week at work was like skiing a black diamond mogul run: hard, fast, having to make crucial decisions in rapid sequence with the likelihood of poor choices having unpleasant consequences, and simultaneously needing to maximize my physical, mental and emotional performance. And I loved it. I thrive on challenge, and languish during times of boring routine. I become downright morose when thwarted in my plans and projects, easily sinking into a state of discouragement and lack of self-confidence. Facing challenges gives me a sense of agency, and so I like to manufacture challenges for myself. This benefits my employers because they get lots of creative, effective work from me. When people write about trying to achieve a balanced life, they usually recommend pulling back from a frenetic pace at work, and making more time for personal, social, and recreational pursuits. And I deeply value those dimensions too (although I have to admit that I sometimes tend to engage in the personal components of my life with much the same intensity as I do in my work life, like skiing moguls). For me, I think balance is not simply about working fewer hours or taking a more laid-back approach while working. I think, instead, it's more about finding a rhythm. I fling myself into projects, work my guts out, revel in the intensity of complete immersion, and then bring that project or period of work to a temporary lull or rest time. Using the skiing analogy, this would be the time at the bottom of the hill when I standing sweating in the lift line chatting with others and then ride the chairlift back up, admiring the view. Type A? Yes, definitely. But I like it that way. Recently, I have had a lesson in loss of connection. Loss of Internet connection. What I learned surprised me. While my companion and I were travelling in Europe this summer, our rental car was broken into when we made a short pit stop. The thief got away with both my laptop computer and cell phone. As you might imagine, I experienced many of the emotions common to victims of a crime: shock, outrage, anger, and a sense of violation. On discovering the smashed car window, we did what I imagine are the usual things. First, in an adrenalin-fueled panic, we pawed through the contents of the car to see what had been stolen. (The idea of being careful not to touch anything in order to preserve fingerprints didn't cross our minds.) Then my partner yelled at me angrily, blaming me for the incident because I had been the one who had wanted to stop at that location. I gave way to hysteria, thinking the thief had also stolen my I.D. (He hadn't.) Then we looked around for the guilty party, questioned others in the vicinity as to whether they had seen anything, and later endured a frustrating morning in the police station in order to make a report to the most bumbling, incompetent officer I have ever met. For the rest of the weekend, I berated myself for having left the car unattended, even for a moment, and for having left anything of value in the car, even though it was all stowed away out of sight. And, then, after a few days, we put the unhappy incident behind us, and got on with our holiday. After all, we had only lost some property, not our health or our lives. As a result of the theft, we lost not only the two devices, but also our connectivity to family back home and to social media. My partner teased me that I was experiencing "crackberry withdrawal," and, in fact, I was. I was withdrawing from an Internet addiction that I hadn't even known I had. For me it was a shaky feeling of being disconnected, a loss of normalcy, a kind of numb emptiness, and feeling of lack of presence in the lives of others. Three days after the theft, I found a community Internet center, where I spent a happy morning reconnecting with my kids, reading and responding to my email from work, and reading Facebook updates. Oh yeah, I also printed out our flight itineraries and tickets, seeing as I no longer had an electronic way to access this information. Then we travelled onward, and for the remaining two weeks of the holiday, I did not access the Internet at all, and only used the phone once (a borrowed one) as we waited in the airport for our flight home. After those first strange days of withdrawal, I rediscovered the freedom of not being connected. For one thing, because I couldn't read my email, I finally was able to fully let go of my work. Usually my email, and therefore my work, goes everywhere with me, and it is as persistent as a cloud of biting gnats that get through every window screen. I also let go of my kids; they were on their own making their own mistakes, which I would not know about until I was back in North America. What could I do about anything anyways from Europe? And the youngest is, after all, eighteen. Now that I'm back, I've quickly replaced the cell phone, and I'm researching which new computer I will buy. Of course, back at work again, I'm as connected as ever. I'm back to blogging and facebooking in spare time. But, in my non-work hours, I'm not checking my email anymore. . . much. And rather than the dire possibilities I was picturing when I had no connectivity in Europe, my eighteen-year-old seems to have blossomed and matured while I was away. I'm not going to give up all the things that I love about being connected. But I'm also going to hold in mind the value of all those things in life that happen when I am not online. One afternoon about a year ago, I had stopped at a colleague's house to drop something off, and she gave me a tour of her yard and garden. As we passed a bush, Connie paused and flicked a couple of caterpillars off the leaves. "They're terrible things; they've completely infested my yard." Connie looked around and picked up a child's plastic sand pail. She flicked some more caterpillars into the pail. As we walked around her yard looking at her greenhouse, garden patches, and various bushes, she continued to add caterpillars to the bucket. "I've been paying my daughter to pick the caterpillars off the leaves," Connie said. "A penny for every caterpillar. I don't want to use pesticides, so I am trying to control them by picking them off by hand." When she had shown me around her whole yard, we ended up down in the back corner where the lawn ended and the wild growth took over. With a flick of her wrist, Connie flung the caterpillars out of the bucket and into the thimbleberry bushes. "Connie!" I exclaimed. "You're not going to get rid of the caterpillars by moving them from one part of your yard over to this other corner." She looked at me shamefacedly. She has a degree in Forest Biology. She knows about pest management. "I just don't like to kill living things. It's the Buddhist principle of valuing the worth of all life." As I drove away that day, I chuckled to myself, thinking of all the effort Connie and her daughter were expending to move caterpillars from one side of her yard to the other. I remembered Connie's caterpillars today, and chuckled again, this time at my own expense. We have had a very wet summer this year and everything is lush and green. I was out in my greenhouse weeding, and picking slugs and snails off of my vegetables. As I threw slugs and snails out the door of the greenhouse onto the lawn, the memory of Connie's caterpillars came back to me. I can't bring myself to kill even slugs. Instead, I give them a fighting chance to survive out there on the grass, a little further away from my vegetables. In fact, when I watch a slug looking for shelter, creeping as fast as it can across bare soil recently denuded of weeds, its head up and its little horns quivering, I feel sorry for it. I guess it's that Buddhist principle at work. And I guess I'm not cut out to be a farmer. Tonight Rob and I went down to the river to a secret place (sshh -- don't tell CN that we trespassed). We parked the sturdy little car beside the tracks, clambered down the bank, and went along a trail to a wide beach of perfectly round rocks. Plain grey sandstone, granite, black rocks with stripes, green ones, brick-coloured ones, creamy pockmarked ones. I love rocks. Everywhere I go, I pick up rocks. I have a black rock from the easternmost point in Newfoundland that weighed down my airplane luggage on my way home. I have a piece of molybdenum ore from the toe of the Hudson Bay glacier, which I carried down a very long, steep trail in my day pack. I have several small pieces of ore from the rock crushing plant of the now defunct Grand Duke mine, which used to be a major employer in Alaska and northwestern British Columbia. From Saskatchewan, I have a large piece of limestone filled with shellfish fossils. I have flat white pebbles from Atlin Lake and agates from Haida Gwaii. I have a small ceramic bowl filled with polished rocks that I purchased one allowance at a time from funfairs and carnivals when I was a child. And many other rocks, unlabelled, their origins forgotten (Mexico? California? Switzerland? the local beach? ), lurk in boxes, on window ledges, or in the corner of the shed. Rocks make me happy. I think that is why Rob took me there tonight. Last night was a night of insomnia, the morning given over to worrying, the afternoon to spinning in circles, and all leading up to an evening of nothing accomplished and nothing decided -- whatever am I going to do?! But instead we went down to the river beach and put our hands on round flat rocks. Rocks ask for nothing. They don't demand answers. Thank-you Rob. This evening I listened to a CBC Radio program on dogs, the nature of their independent pursuits, dog life, and how to communicate effectively with dogs. One of the speakers commented that what is interesting to her is not how to make dogs obey humans, but rather their willingness to do what we want. She observed that dogs just adore humans. Sometimes I get too caught up in language and general busyness to be observant of the clear evidence of caring that surrounds me. I race around in a huge rush, my eyes focused inwardly on the complex of troubles and tasks filling my mind and my time. At the end of a week in which I didn't manage to check off all the tasks on my list, or when some objective was thwarted, I might feel glum and dissatisfied. I finally lift my head looking for pleasurable distraction and entertainment, and if it doesn't materialize at the speed of a click of a button, I am quick to complain. I might feel unloved and unworthy of love. But it is because I have turned my eyes and mind away from noticing the loving pets and the loving humans that surround me. A few minutes ago, I opened a kitchen drawer looking for a tea egg. As I groped through the drawer, my hand found a wooden cone-shaped implement with a round handle. There is a story that goes with this object. Meanwhile, my dear partner Rob had decided find his own solution to the lack of a pestle. He went out to his workshop and made not one, but three different sized wooden implements for me to try out with the sieve. Each was beautifully sanded and finished. So I now own four pestles for making apple butter. What a surfeit of love! How very lucky I am! I just have to open my eyes to the love all around me. This recipe for Moussaka is from About.com. The link will take you to a video and great recipe. Have you ever broken a thermometer and seen the mercury form little silver balls that roll away across the floor? I have. I was in grade seven and had taken to carrying a thermometer with me everywhere. I was doing a science project which involved measuring my own temperature at different times of the day and before and after various activities, like running a mile or taking a bath, to see how much it fluctuated and what might cause it to rise and fall. I was reminded of that mercury yesterday evening. I was standing in my kitchen staring blankly at the empty metal sink; I had just heard some bad news. A single drop fell from the tap, and as the water hit the metal surface, the water balled up like mercury and rolled outwards in a star-burst pattern. I tried to cause another drip to fall so that I could see those little silvery balls again, but I was unable to recreate the event. Later, out for a walk in the rain with the dogs, I thought about "Rosa," an elderly neighbour in my hometown, a close friend of my mother's. Rosa has just received a diagnosis of multiple cancers; it is likely that there is nothing anyone can do. Rosa is the kind of person who is the heart and soul of the community. At eighty-four, she runs the community soup kitchen, drives shut-ins to their doctor's appointments, and helps her neighbours complete their income tax forms. Seven years ago, during the last two days of my father's life, Rosa showed up to sit by his deathbed, spelling family members off for meal and nap breaks. On my way home, after a grand loop of the neighbourhood and park, I found myself standing under a street lamp, staring up. There they were again, silver droplets, almost solid. Raindrops arrayed around the light, falling hard, hard. Perhaps it was sleet? I inspected the gravel road, the fur of the black dog, and my sleeve for white scurf, a melting crystalline structure. Just rain. Rain plummeting down. I followed the dogs to the next street lamp, and stared up once again. The silver bullets turned white before my eyes, and wavered in their fall. On my sleeve a tiny tangled substance, like the skeleton of a sea crustacean, before it melted. I was present for the moment of transformation. Rain to snow, silver to white, bones to oblivion. This is, after all, the way it goes. Getting old -- I never thought it would happen to me. I used to subscribe to a women's magazine that has a section called "firsts after forty." In it, they present profiles of women in their midlife who have taken up some new sport or endeavor, such as snowboarding, ballet dancing, or playing the violin. I find the idea inspiring. I love the challenge of taking up something new. The world is so rich and full of possibilities that I don't know how I can fit in everything that I would like to do in the time left to me on this earth. In the last five years, some of my new avocations have included playing the guitar, fly fishing, back country skiing, wilderness canoeing, greenhouse gardening, mountain biking, and telemark skiing. Of course, as I am now in the latter half of middle age, I do not have the fitness and stamina to perform these activities at the level of a twenty-something. I don't mountain bike down the technical trails but rather up and down logging roads. The area where I like to back country ski is jokingly referred to by the back country crowd as "the geriatric run." When I garden, for every half hour of heavy digging, I spend another half hour sitting on my bench looking at the garden and daydreaming about it. Then there are the little aches and pains that become more insistent and limiting over time. The achy back. The sore, stiff knees. When I was twenty, I didn't think that I had had a good day of skiing unless I had taken twenty runs or more. In the last few years, I have aimed for eight or ten runs. I mostly stick to the groomers and only include one or two or three mogul runs or deep powder runs per ski day. I have become used to feeling stiff and sore all the time. Ibuprofen is now my friend. But I am not ready to give it all up. I can live with the idea of only skiing half days, and staying off the black diamond runs most of the time. I can even (reluctantly) accept the idea of quitting soccer, as I can see have reached the stage of being a liability to my team in a league of mostly twenty-year-old ex-high-school soccer stars. But I am a skier. I have skied since I was three years old. Being a skier is part of my core identity. A skier is who I am. This week, the medical specialist whom I saw about my failing knees told me that skiing is over for me. No more skiing. No more soccer. No high impact sports at all. If I stop now, I can delay the inevitable need for a knee replacement. When I am not in front of my computer doing things with words, this mountain is one of the places that I like to be. Writing the first draft of my novel was fun. I cannot say that it was hard to write it at all. That is not to say that the story just flowed onto the screen. I struggled over sections and got stuck in plot dead-ends. Certain parts didn't work quite right; I wasn't happy with them and not sure how to fix them. But I was happy to sit down to the story and write. Finding enough time to commit to writing was the only hard part (busy life, blah, blah, blah). In November, I began to recognize that some aspects of the manuscript needed work, thanks to a brief but helpful critique from Robert Ray. Although I have read many inspirational books on writing in the past, I began to seek out nuts-and-bolts writing books and websites. I have been reading about plot, subplots, character arcs, back story, building suspense, and so on. And I am finally getting down to working on the revisions. I have a complex, layered story. I have a good character arc for my protagonist that starts on page one and runs through to the last sentence. My main antagonist is well-rounded with a good character arc (although his exit still needs a bit of work). I have tension-building secrets and multiple subplots. I have a three act structure (with a twist). I have made good use of different character POVs and differentiated the characters' voices. But here is the bad news. Much of the first half of Act 1 takes place inside the main protagonist's head. By having my protagonist recount, remember, and think about things, I am telling rather than showing, and it is sloooowwww. In many sections (e.g., the opening), the ms. lacks vivid word pictures to place the characters in the setting and show what they look like and what they are doing. My protagonist's core motivation is not clear. That means that I have a lot of rewriting to do. But at least now I have a better grasp of the task that I face, my revision objectives, and some tools to work with. Ah, revision. It actually feels better to have finally started revising (even though there are way more troubles than I initially thought, which is as depressing as hell) than it felt to be: a) fooling myself that hardly any revisions were needed (blush); b) realizing that some revisions were needed but avoiding getting started on them; c) in despair that the entire manuscript was unsalvageable; and then d) wanting to revise but having no idea what to do and how. This oil painting by Melanie Rocan was published in Room Magazine, a wonderful literary and art magazine published by a women's publishing collective in Vancouver, British Columbia. Check out the artist and the journal. Eileen groped for the snooze button. Her eyes popped open. Silver dust motes danced in light from the uncurtained window. She hurried to shower, noticing again the chipped sink, running toilet, and mildew around the tiles. The landlord’s rate for these shabby digs was a scandal. She dressed in thrift store duds: short cream blazer with a back flare, chocolate brown wool pants, knotted beige scarf, and some dead woman’s low-heeled pumps. Finally, she placed her grandmother’s jasper ring on her left ring finger where the wedding ring wasn’t. She planned to ace the interview; she needed the job. It was useful, I suppose, to stretch my mind around incongruous words that do not belong together -- an enjoyable diversion. I also had fun last night reading through my old poems. Next goal -- those revisions!